Lake homeowners: You need to watch for incoming exotic plants, or else! BlogUncategorizedLake homeowners: You need to watch for incoming exotic plants, or else! For those who own houses on lakes, or who spend any amount of time on them, being able to boat and swim in clean water is of paramount importance. Nothing will ruin your enjoyment and reduce the value of your property faster than the encroachment of invasive aquatic plants. They clog motors, they ruin beaches, and they smell when rotting in massive quantities. If your lake is still free from these plants then you should seriously consider doing all you can do keep it that way, and the best way to do so is to monitor your lake for the plants. If you expect someone else to do it for you, expect to be disappointed; it is highly likely that no one cares about your lake more than you do. The Cooperative Lakes Monitoring Program offers the Exotic Plant Watch program at the cost of only $25 a year. If you enroll, you will be trained to find and identify four common invasive aquatic plants: European Milfoil, hydrilla, curly-leaf pondweed, and starry stonewort. It will then be up to you and your neighbors to monitor your lake, though the program staff will give advice and can confirm your plant identifications. If you don’t find any plants, that’s great! But if you do, the best way to stop their spread is to act quickly, before the plants become widespread. It is relatively simple to treat and remove a small amount of invasive plants; it is extremely expensive to control them once they have spread throughout the lake and virtually impossible to eradicate them. Hydrilla is not yet found in Michigan, but is knocking on our front door. 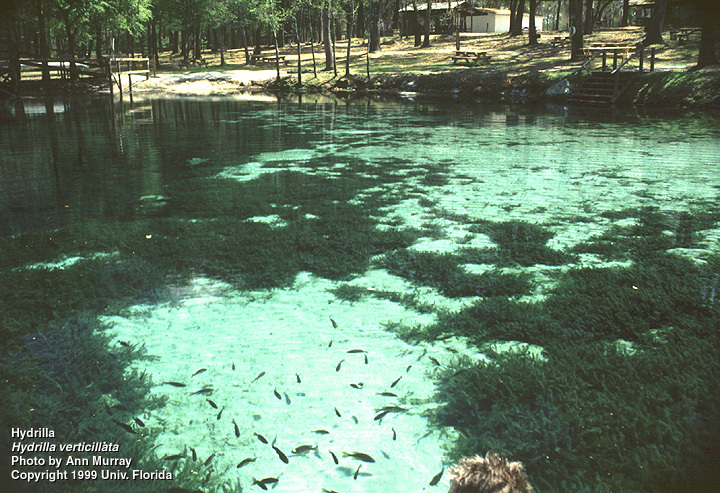 It covers a lake with a thick green blanket like we see in this picture from Florida. Photo by Ann Murray, University of Florida/IFAS Center for Aquatic and Invasive Plants. Used with permission.